AUSSIE RULES: The Bundaberg East State School is one step closer to becoming the best primary school in Queensland in Aussie Rules. The school claimed the Bundaberg leg of the AFL Queensland Schools Cup yesterday, beating Norville State School in the final. 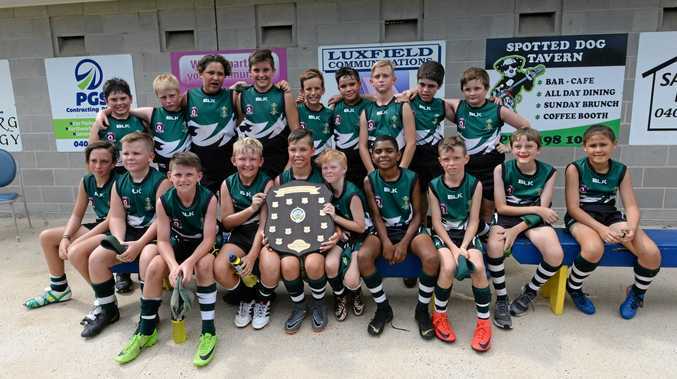 The tournament saw six schools compete with Branyan Road State School, Agnes Water State School, Burnett Heads State School and Moore Park Beach State School involved as well. Easts claimed the final after running over Norville in the second half of the final. The team, up by four points at half time, kicked three goals and five behinds to win by 27 points. "They were just consistently good all day," Bundaberg East State School PE teacher and coach Nick Biggs said. "They stuck to the basics of footy, running hard, tackling hard and holding structure." The win was redemption for earlier in the competition after Norville won by nine points in the pool rounds. "We missed three goals in front (during that game)," Biggs said. "I just said 'do what you are doing' and you'll win. "They kicked a lot straighter in the final." The players said it was a team effort to win the competition. "It was actually pretty great, I didn't expect us to get into the finale so quickly," Bundaberg Easts State School student Ryan Hayhoe said. "I'm proud of our team for making the finals. "We got a lot of points and we had a good try and had fun," Shane McDonald added. The school now qualifies for the semi finals of the tournament, which will be held in August on the Sunshine Coast. "It's an option (for us to do) but we need to consider the work loads of the kids," Biggs said. "It's going to come down to a school decision." There are photos of the Cup featuring other schools on page 34.